For years Hauppauge has been making high quality add-ons to make your computer entertainment experience better. They've done it again with their HD PVR. This compact unit connects to your PC through a USB 2.0 interface for high speed data transfers. The back panel has Component Video, RCA audio and optical audio inputs with loop through outputs for each. The loop-throughs let you put the PVR in-line with your cable/satellite box or other video source and your TV. Front panel connections let you add additional input sources like a game console. An IR blaster will send a signal to the video source to change to the appropriate channel to record your program. The included suite of Arcsoft software lets take full advantage of the PVR's capabilities. TotalMediaExtreme handles the capture, edit and playback functions. MediaConverter lets you save the file in a different format including the Blu-ray compatible AVCHD. Watch what you want, when you want to with Hauppauge. 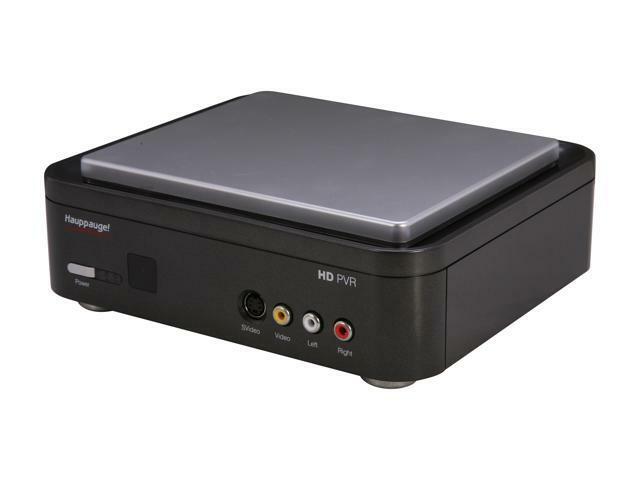 High Definition Video Recorder With the Hauppauge HD PVR, capture your favorite high-definition TV programs from any HD set-top box or HDTV featuring component video outputs. The built-in H.264 hardware accelerator encodes up to 1080i signals into AVCHD from 1 to 13.5Mbps and records audio in AAC or Dolby Digital for amazing recording quality. Additional Video/Audio Inputs The Hauppauge HD PVR provides S-video, Composite and RCA Audio inputs so you can capture video or audio sources from other AV devices such as your VCR, game console, camcorder and more. Note: the video input format determines the recorded format. For example, 1080i input records at 1080i, 720P records at 720P, etc.. Any other format conversions needs to be done with the MediaConvert program (supplied). Pros: Great picture quality. Includes enough cables to get going. Easy setup in MythTV. Cons: Bulky and ugly (twice as large as I expected). There are four bright blue LEDs on the top of it that light up as it's recording which are very obnoxious; I have covered them with electrical tape. Other Thoughts: After connecting it initially to a Windows machine to install the latest firmware, I have been using this device under Linux with MythTV. It is recording from my cable box very well at 1080i or 720p resolution and I am surprised at how good the picture quality is. Optical digital audio is working fine as well (bring your own cable). Setup was surprisingly easy. The modern Linux kernel already has the drivers and MythTV has supported it for years. I am accustomed to having to tinker with stuff for hours to get it to work in Linux, but this was a close to plug and play as possible. Other Thoughts: If you're looking for game capture card strongly suggest getting one if these. Preferably the newer model which is, the HD PVR 2 gaming edition or the gaming edition plus especially if you have an Xbox One and you wish to record. Pros: I use this to transfer video to my cpu for editing YouTube videos and making Blu-ray discs. Good, high quality once you adjust the settings and raise the input bit rate to 13.5mbps (default is 9 I believe. Good, but not great). Uses component video cables and a choice of component audio or optical. I've owned it for over three years and have never experienced the over-heating issues I see some people speak of (knock on wood). I guess I've lucked out there. Default capture format opens right up in Sony Vegas, my preferred editing program. All-around handy device that gets the job done and from what I've read I'd recommend it over the PVR 2 gaming edition. You can still use component cables to record PS3 games. Only issue is if you want to capture from the PS4 you'd need the PVR 2 since the newer console no longer supports component output (HDMI only). Cons: PVR and ArcSoft software are very finicky. You have to get to know what they 'like' and 'dislike'. I have experienced a lot of problems I've read other people write about. I've had videos fed in by the PVR cause Vegas to freeze and crash for seemingly no reason. If you're using ArcSoft to feed in video and need to close out of it, opening it back up will sometimes cause the program to 'lose' the PVR and think the device is still being used by the former instance of the program before you closed out of it. I agree that a cpu reboot normally fixes that issue. As far as the PVR sometimes freezing up during recording or crashing Vegas when you attempt to import a video, aside from making sure the PVR drivers are good (very important), this is what I do to remedy the issue: I reboot my cpu. When it is finished loading and ready to go, I power on the PVR (USB cable already connected to cpu). Once Windows acknowledges the PVR with the usual sound, I pull the power cable out of the PVR for about 10 seconds and plug it back it in. I listen for the Windows USB sound again, then I open the ArcSoft capture software and I'm good to go. Don't know why, but this works every time. When I forget to follow this process step by step I usually have problems. Either the ArcSoft capture software will freeze during capture, or the captured video will crash Vegas repeatedly and I'll have to feed it in the cpu again (very annoying). Another thing I dislike about the PVR is it will not read input from standard definition devices most of the time. If you have a stack of old home movies on VHS tapes you want to feed in from a VCR, or if you're an old school gamer and want to record playthroughs from the old NES or SNES (Genesis, etc) you'll need to pick up a Dazzle recorder w/Pinnacle Studio. 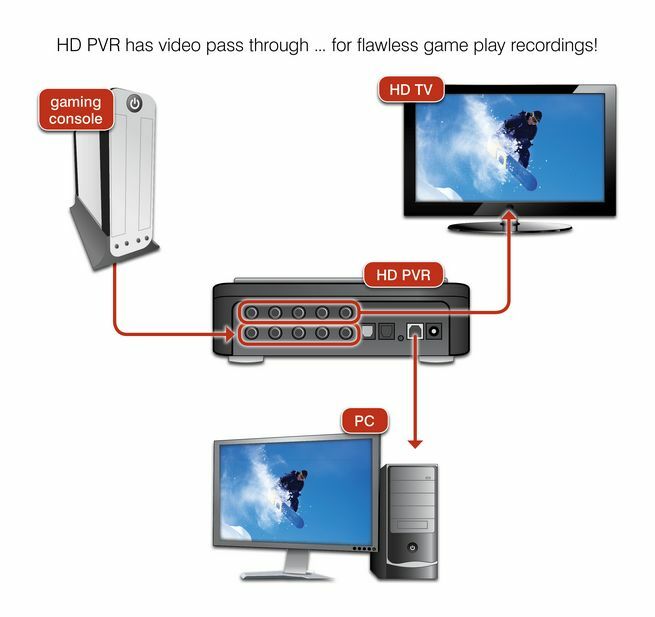 The Hauppauge PVR will not read anything with a resolution less than 480p. Big issue seeing how VHS tapes come in at 480i and the old video game consoles output at 240p. Get a Dazzle recorder for $50 to take care of this. Other Thoughts: If you're a driven videographer and refuse to take 'no' for an answer from any piece of technology, this PVR is the best device on the market. Once you get familiar with it's qwerks and jerks it'll do a fine job for you. If you're more of a casual editor and don't have a lot of patience you'll probably throw it through the wall and find something else to do. Pros: nice looking box. Pretty blue light. Cons: No product support for linux. Tech Support claims VCR & tapes a problem with the unit. Other Thoughts: I bought this product based on previous experiences with Hauppauge products. The hdpvr 1212 is the last that I will purchase from this company. I am returning it as soon as I can box it back up. If in doubt, do a google search for "hd pvr heat problems" or "hd pvr stopping" and count the unresolved threads. Pros: Easy setup, Good quality recordings, works in Windows, OSX, even Linux. Other Thoughts: Newegg is great to do business with. My only gripe is with the packing of products. I received hard drives & electronics packed with crumpled paper while cables have been in a big box with a million packing peanuts. Pros: Works great with Windows 7 media center. Cons: Hangs at "scanning for channels 0%" when adding device to Windows 8 media center, making it unusable in Windows 8 media center. Other Thoughts: Many people report the same issue on the web - but no help on the Hauppauge web page. The supplied application "Total Media Extreme" works under Windows 8 but that application is very limited. Cons: It's kind of annoying how it runs off of HD Component cables. They are extremely bulky and a pain to work with. I've been using the Hauppauge HD PVR for a little under a year now, and there's one MAJOR problem with mine. I'm sure that it's a problem with only my device, but it's a MAJOR problem none the less. One of the video cable plugs on the device itself is very sensitive. If the cable isn't plugged in a certain way, than the screen will go black. And to top that, even when it is plugged in right, it will cause the screen to go black for a couple of seconds, then work correctly for a minute or two, then black out for a few seconds, work for a minute, repeat over and over again. -software is easy to use and allows you to record not only off the PVR but the software allows you to record things off your Webcam too if you have one. -Livestream's procaster allows you to select this as a device to stream from. -Does something weird with the Wii sensor bar if you use the composite ports in the front. It makes the cursor waaay too jumpy and sensitive. Adjusting the sensitivity didn't work . Also, plugging a Wii into the composite ports and playing a GameCube game also messes up your aim and the direction that you move your character in. Other Thoughts: -I found an electronics store an hour away had the same products as this but Newegg had it for a cheaper price and yes it was cheaper on Newegg even when taxes and shipping were included -thank goodness. -The software apparently doesn't work on a Mac. A Friend of mine found that out when I took the PVR over to his house. To me it's not a con as I have a PC, But Mac/ Apple users beware. -As stated in the Cons, The Wii cursor acts weird when you have the composite cords plugged it. The only way to fix this is to get come Wii component cables to plug into the back of the PVR. -In order to record in the highest quality possible, you will have to change the input resolution in the software. Also depending on what device you have set up, you may have to change the screen resolution. If you connect a Wii to this device, you'll need to change the Wii's screen resolution to 480P or higher -I was able to change the screen resolution to 480p on my 17' TV screen after I plugged in the Wii component cables.